Almost never undersold. If you find a better price email us their quote and we'll likely beat it. 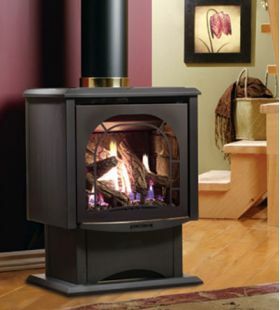 The FDV200 Direct Vent Model provides sealed combustion where it draws outside air for combustion. This model can be vented either horizontally or vertically. These units usually stand away from the wall and are very similar to a wood burning stove in appearance. Available for direct vent, vented and vent-free applications. Coaxial vent system of a pipe inside a pipe (generally 4"/7") the inside pipe is for exhaust, while the outer pipe brings in outside air for combustion. The design of these fireplaces allow for a completely sealed system that does not compromise inside air quality of your home. It also lets you vent a product horizontally (great for when an appliance is installed on an outside wall). Direct vent appliances are usually limited to a length of 40ft (with a maximum horizontal length of 15ft) that will allow an appliance to function properly.